ZEB: Err...err, many thanks to Iswaran and Deanna. But most of all, I am gonna miss all of my wonderful friends...I am gonna sorely miss all of you. Blue badges in 2 years time. JJ: Thank God for the opportunity to attend this great course and make many great friends. Maintain the network and don't forget the blue badges, 2 years from now...he..he..he....! FAIRUZE: A rememberance that shall not be forgotten. Never been so shy before. Thanks again to all for being so supportive. Thanks to the istructors, Mr.Iswaran and Ms.Deanna. Going to miss the whole class. All the best. P.s. Our class also "MALAYSIA, TRULY ASIA"! HAIZAN: Most memorable short courses with very vibrant members. SUBIAN: Exiciting course, though it disrupt my normal activities and work. Nice and....coursemate. OVIA: To all, I appreciate all of your assistance, the memory with all of you and definitely miss you all from 1830 to 2130 daily. Good luck, Good health, God Bless You! AGNES: Nice to join this class. 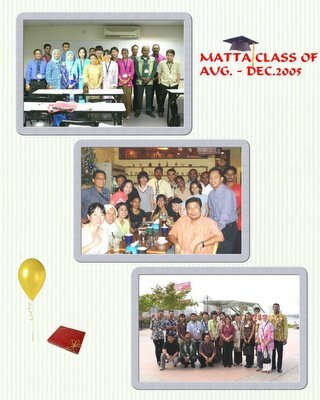 I will not forget all the friends and instructors in this group in my life. Hope our friendship last forever. Don't forget to keep in touch always..ok! APPLE: It's very exciting. I am glad and very happy to meet al of my classmates. Hope we can all meet again in the field. VIJI: My short time with all of you was very educational. I would like to thank each one of you for helping me out and making me feel comfortable. Good luck and best wishes. Hope to meet you all again in the future. KARTHIK: First of all, thanks to Mr.Iswaran and Ms.Deanna for all the knowledge that had been shared with us...I had a real good time over here....with my fellow classmates. All of us went through up's and down's. Always remember, no matter what it is..just stay COOL!!! Take care...will be missing you guys!! IRWAN: Thanks for the happiness and sadness! Keep in touch guys! SYED: Thank you for all being good classmates and good friends. Hope we can meet again in the field. Good luck!! Hope everybody get the badge!! SHAIFUL: Thanks to our instructors Iswaran and Deanna for their attention and guidance. From 'ohh...ohh.... ' to 'for your information....' and thousand thanks to all classmates for the supports and cooperation. "Tolong-lah Matta!" NISHA: It's fun to join this class. It's fun and exciting people to meet. I'm definitely going to miss this class. Thanks to Iswaran and Deanna for the wonderful lessons and guidance. WENDY: They've said it all...it's a fun-filled experience for the four months of the course. What is most important is at the end, the espirit de corp spirits shone through when the going gets tough especially on the final run of the exams period. Regardless what race or background we are from, in the end we all stood as "BANGSA MALAYSIA". This is the true spirit of being a Malaysian, when the going gets tough, we can all depend on each other to help each other get through the obstacles. Let's us maintained this spirit even in years to come and maybe we can bring some changes to the mindset of those who bear to differ from this spirit of espirit de corp and 'Bangsa Malaysia'. Last but not least, special thanks to both our wonderful instructors, ISWARAN and DEANNA who have somehow or other, impact our thinking of what being a Malaysian is truly all about. The course may be a short one but the experiece will be lifelong. I admire their patience, their support, their guidance and also their sacrifice for spending the long hours of extra classes for us. And not forgetting Yvonne for her help in the administration side for she is the one that helps us on the background. 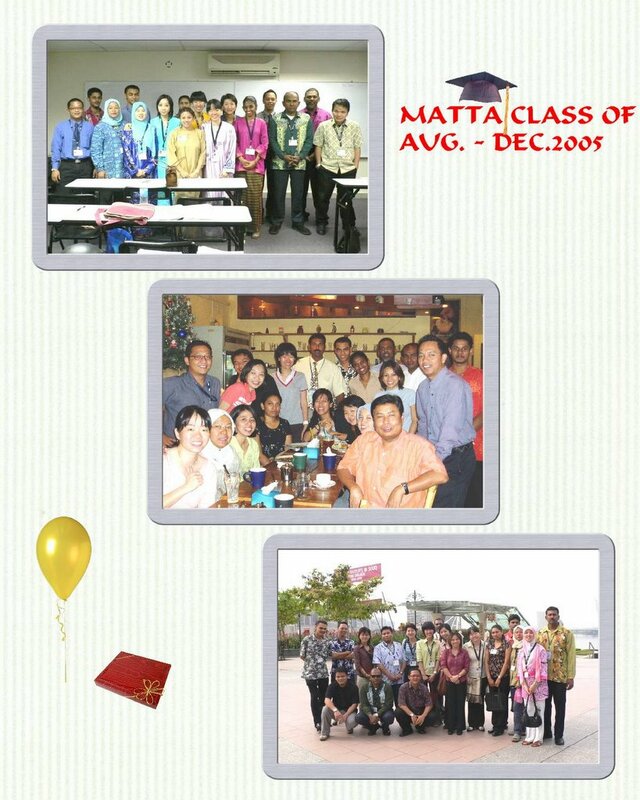 May the spirit of MATTA Class August 2005 lives forever! Epiphytic orchids live on trunks and branches of shrubs and trees. It is a widespread misconception that orchids are parasites: orchids cause no harm to their host and use them for support only. Epiphytes receive nutrients from the air and from small bits of detritus left by birds and dead plant material. They depend on rain and mist for their water supply. The main advantages for epiphytes are less competition with other organisms, a better light supply and better protection from parasites, diseases and fire. To overcome water-stress most epiphytes have developed adjustments, enabling them to store water, such as succulent pseudo bulbs or fleshy leaves. There are many different host plants, they are mainly chosen because of their structural and chemical bark features. Many species show particular preferences as to the type of host and often are localized in their occurrence. The majority of orchids grown by man around the world are Epiphytes. Many are grown mounted on wooden rafts such as cork; some are grown in baskets; and some can be grown in pots in an extremely porous mixture of bark, perlite and charcoal. 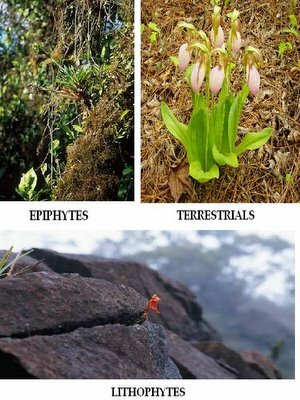 Dendrobium (M’sia largest export of cut flower), Tiger Orchid (world’s largest) and Taeniophyllum (world’s smallest) are common examples of epiphytes. It is relatively common for epiphytes to also grow on rocks which provide no nutrients to the plant. There are also many orchids which do not grow on trees at all, but only on specific kinds of rocks. These plants are called Lithophytes. The term comes from the Greek words, litho-, meaning stone and phyte, a plant--thus a plant that lives on stones. Often they are found around the bases of trees or in crevices on rocky hillsides where pieces of debris collect. An example of lithophytes is Sophronitis. Lithophytes orchids grow on rocks. The surface of rocks seems to provide a good place for germination and attachment of seedlings. Only a few orchids are exclusively lithophytic, most will also be able to develop as epiphytes or terrestrials. 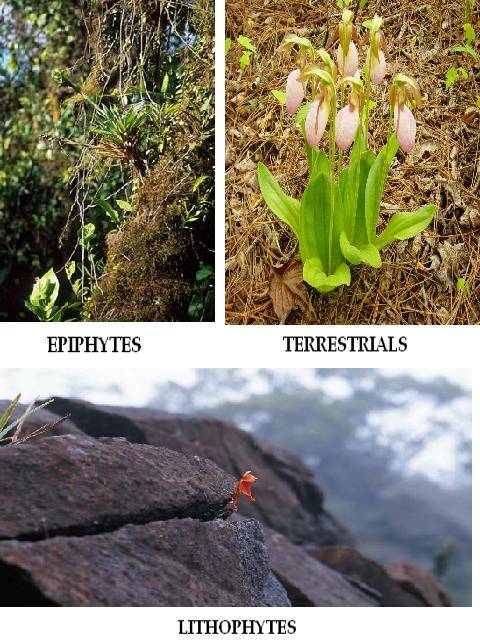 Terrestrial or ground orchids are rooted in soil; they occur in different types of habitat (forest floor, grassland, woodland) and at altitudes from sea-level up to 3000m. Many of them are deciduous which means that the plants loose their leaves and have a dormant period in which no growth occurs. The underground parts (tuberoids) store food reserves to ensure the development of new shoots at the beginning of the next growing season. Other species are evergreen. Examples of terrestrial orchids are cymbidiums and most of the slipper orchids. Some terrestrial orchids do not have any chlorophyll, they get their nutrients from dead and rotting material, these are called saprophytes. Due to their specific requirements orchids are good indicators of the ecological state of an environment. They can only grow well in unspoiled places and die quickly if their environmental conditions change. Epiphytic species are mostly confined to tropical regions while terrestrials are more widespread in cooler areas. This brief introduction provides the context for the Heritage Trails, which focus on pre-war buildings. Kuala Lumpur had its origins in the 1850s when the Malay Chief of Klang sent Chinese upriver to open new and larger tin mines. They landed at the confluence of Sungai Lumpur (now Gombak) and Sungai Klang and established mines at Ampang. Later, tin mines were opened at Pudu and Batu. This trading post was a wild frontier town plagued by floods, fires, disease and the Selangor Civil War (1870-73). During this time, Kapitan Cina Yap Ah Loy emerged as a leader, responsible for the survival and growth of the town. In 1880, in view of its strategic location, the Selangor state capital was moved from Klang to Kuala Lumpur. Nothing of this earlier period remains as all structures were of wood and atap (thatch) which were destroyed in the fire and subsequent flood of 1881. The multiracial community of this period settled in various sections of town. Market Square, east of Sungai Klang, became the commercial centre for the whole town. The Chinese congregated around this Square and south into Chinatown. To the north, across Java Street (now Jalan Tun Perak), were the Malays. Nearby, a number of Indian Chettiars (money-lenders), and in later years Indian Muslim traders, set up business. West of the river, the Padang (now Merdeka Square) was the focal point of the British administration. Kuala Lumpur continued to grow despite two World Wars, the rubber and tin commodity crash and the State of Emergency (1948-60) during which Malaya was preoccupied with the communist insurgency. In 1957, the Federation of Malaya gained its independence from British rule. Kuala Lumpur remained the capital through the formation of Malaysia, achieving city status in 1972, and was established as the Federal Territory in 1974. 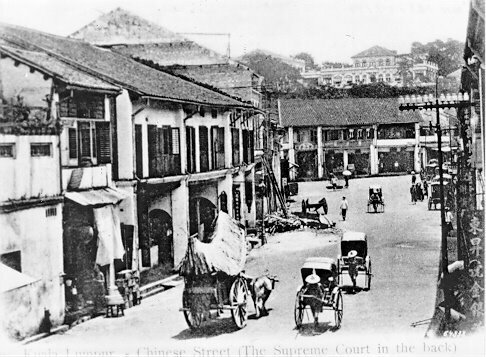 The original Chinese town centred on Market Square. As the population grew, expansion was constrained by swamps, hills and the river. High Street, now known as Jalan Tun HS Lee, became increasingly popular as it was higher than the rest of the town and therefore less prone to floods. Kuala Lumpur was a typical "pioneer" town at the turn of the century, filled with a rough and tough population that was largely male. Men who could afford it spent most of their leisure time in the brothels, opium dens or gambling booths. For entertainment, there was Chinese wayang (opera) or bangsawan (Malay theatre). There was the continuing problem of maintaining law and order. Up to his death in 1885, Kapitan Cina Yap Ah Loy, who owned much of the land in this area was responsible for maintaining peace but was not given money or manpower to discharge his duty. Left to his own devices, he made use of the secret society's coercive power. This system itself created disorder with outbreaks amongst rival gangs. After the 1890s, civil unrest was curtailed with the set-up of British security forces. The Chinese leaders provided for the community through associations, benevolent societies, temples and foundations. Through these organizations, free lodging, work, contact with China, education, medical and funerary needs were facilitated. Given the practice of venerating the ancestors, a sense of security was provided against the horrors of dying outside the motherland, which the Chinese believed left their spirits wandering. 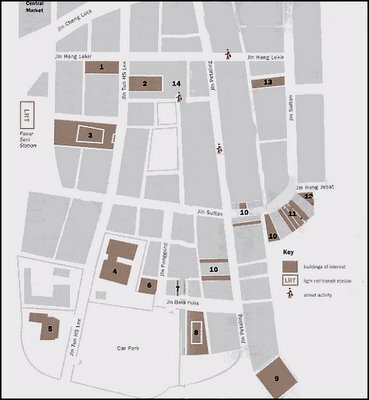 The wealthier and more ornate shophouses were built north of Jalan Cheng Lock, closer to the business centre. Simpler shophouses were built in this area, which is now popularly called Chinatown. Although undergoing rapid transition, Chinatown still has a number of functioning shophouses, with the business operating in the "shops" on the ground floor and residents living in the "houses" upstairs. Situated on the corner of Jalan Tun HS Lee and Jalan Hang Lekir is the Lee Rubber Building that was designed in the Art Deco style by AO Coltman in the 1930s. The building has a strong geometric shape with the corner set at a 45° angle, separating it into three unit bays. Mullions, located between the windows, emphasize the front facade. Lee Kong Chian, a rubber magnate, industrialist, banker and philanthropist founded Lee Rubber Company.In 1952, he set aside a large part of his wealth for the establishment of the Lee Foundation. This is a philanthropic institution devoted to advancing causes such as culture and education. 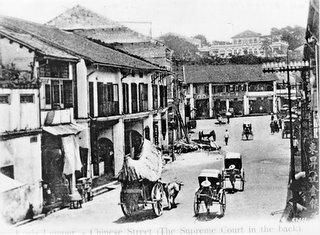 This Association was established in 1886 by migrants from Guangdong Province in China, mainly from the prefectures Kwong Foo and Siew Foo, hence the name Kwong Siew. The Association building was constructed in 1888 by artisans from China and restored in 1995. It incorporates a Taoist temple dedicated to the Chinese deity Kwan Ti (God of War and Literature). Two stone lions guard the entrance to this colourful building. The fish on the entrance gate represent abundance. At the lobby, the altar on the right is to Man Cheung (God of Examinations and Fate), and on the left, to the God for the Elderly. In the main hall at the rear, the central altar is devoted to Kwan Ti. He is flanked on the right by Thai Swe (Guardian of the Year) and Kuan Yin (Goddess of Mercy). The left altar is to Choi Sen (God of Wealth) and the Tiger God. Worshippers bring offerings of flowers and oranges, and light joss sticks or incense for the gods. Thamboosamy Pillai originally constructed this building as a private Hindu temple. It remained in the hands of the family until the late 1920s. The old structure was replaced with a new Temple that was consecrated in 1973. This Temple resembles the form of a human body lying on its back with the head positioned towards the west and the feet towards the east. The gopuram (tower), the tallest structure in the Temple, corresponds to the feet of the body and is the threshold between the material and spiritual world. The dramatic 22.9m (75ft) high pyramid-shaped gate tower is decorated with depictions of Hindu gods sculpted by artisans from southern India. At the rear is the garbagraham, which corresponds to the head. It is a freestanding structure with its own roof and walls and has one entrance that faces east. This is the inner sanctum where the chief deity Sri Maha Mariamman is installed. The priest stands in front of the garbagraham when performing the puja (prayers). Ganesh is in the shrine on the left and Subramaniam, his brother, is on the right. Ganesh is also found at the entrance as he is the remover of obstacles. The eight female figures inside the Temple are of Lakshmi (Goddess of Wealth).During the Thaipusam festival, Subramaniam's silver chariot is paraded from this Temple to his shrine in Batu Caves. Through the 1880s and 1890s, Kuala Lumpur was beset by civil unrest. The Commandant of the Selangor Police, Captain HC Syers, dispersed the police throughout the town and countryside as a civilian peacekeeping force. He differed with the official position, which called for a para-military force concentrated in a few strategic locations such as the customs, mines and Residencies. Thus in 1895, the new offices of the police department were opened, with a fireworks display, at this location on High Street (now Jalan Tun HS Lee). The event was attended by Kapitan Cina Yap Kwan Seng and other leading towkays (honorific for Chinese men of high standing) of Kuala Lumpur. This station was manned by a Sikh and Malay contingent and also housed, at some point, the Chinese Secretariat. This building is constructed of timber with a masonry base and a Marseille-tiled roof. Large keystones decorate the arches. The ground floor has been expanded by enclosing the veranda. The building was declared a fire hazard in 1995 and the police force was relocated. In the 1880s, some prominent citizens, including Kapitan Cina Yap Kwan Seng, Towkay Loke Yew and Thamboosamy Pillai saw the need for a good English school in Kuala Lumpur. They built the Victoria Institution in 1893 with the help of the British Resident, WH Treacher, and donations from the Sultan of Selangor. It was unusual, as it was neither a denominational nor government school. Part of the funding came from donations and the rest from the balance of Queen Victoria's Jubilee Fund in 1887, hence the school's name. Designed by AC Norman, the building was based on an English cottage, half-brick and half-timber, with Gothic features. The lower floor, a playground originally, has Gothic arches. The upper floor housed three classrooms that were interconnected by arches. Part of the original veranda above this lower floor can still be observed at the rear of the building. In 1911, the headmaster's bungalow, which used to be sited on the school grounds, was the scene of a murder that stunned the local community. The episode was immortalized by Somerset Maugham in one of his famous short stories which later was adapted for the film called "The Letter". In 1929, owing to lack of space and its flood-prone location, the school moved to new premises on Petaling Hill, now Jalan Hang Tuah, where it still stands today. At various times, the building housed the Technical College, the High School and Panggung Drama (Drama Theatre). In 1886, the telegraph line from Malacca reached Wang and was then extended to Kuala Lumpur.As soon as the mail steamer was sighted at Klang, the news was telegraphed to Kuala Lumpur and the Post Office hoisted a red flag to inform the population that mail would arrive shortly. The flag came down as a signal that it had arrived. In 1911, this Post Office with living quarters was constructed on the corner of Jalan Balai Police and Jalan Panggung. It is a two-storey Tudor style cottage, with a veranda around the first floor. The corner is addressed with a splay entrance. The Selangor and Federal Territory Laundry Association at Jalan Balai Polis is a 71year-old guild established to cater to the social welfare and interests of its members. The Association continues to meet here every two months. Portraits and photographs of founding members are displayed on the walls. The Old China Cafe leases these premises from the Association. The shophouse still retains many of its original features such as the half door at the front entrance, the stairway and the back door with its wooden locking devices. The Cafe has many of the original furnishings, including the pulley lights, feng shui (geomancy) mirrors, marble top tables and bentwood chairs. The ambience is evocative of the 1930s. Of interest is the silverware that previously belonged to the prestigious E&O Hotel in Penang. The Cafe serves Nyonya food, a cuisine of the Peranakan or Straits Chinese, descendants of early Chinese-Malay intermarriages, whose culture is a fascinating hybrid of both traditions. Many Sikhs came to Malaysia during the Colonial period to work as policemen. Some of them joined the Malay States Guides, a semi-military local defence force created in 1896 as part of the FMS Police. The Guides had a Sikh priest attached to the regiment. This Temple was established for the police force in Kuala Lumpur. Unlike a Hindu temple, the Sikh gurdwara (place of worship) can be housed in any type of building and no particular emphasis is placed on religious decorations. Outside is a flagpole flying a triangular flag with the Sikh insignia, a calligraphic symbol created from two Punjabi letters which mean "God is the eternal reality". 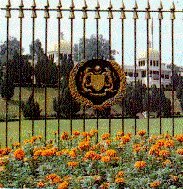 On the entrance gate and at the apex of the roof is the Sikh symbol, which is a double-edged sword, surrounded by a wheel. The former symbolizes God's truth and justice and the latter indicates the unity of God. Flanking the wheel are two daggers representing the temporal, secular and spiritual power. Focus is centred on the Guru Granth Sahib (Holy Book of the Sikhs), which is placed on a dais that generally faces the entrance of the gurdwara. The book is highly revered and is covered with a romalla (silk cloth) when not in use. The Federation of Chen (Tan) Clan Associations of Malaysia, or Chan See Shu Yuen Association, was established in 1896. Representing families with the Chan, Chen, Chin, Tan and other variants of the family name, this Association has about 1,300 members. The building, constructed in 1906, is a fine example of Chinese temple architecture, with open courtyards, symmetrical pavilions and decorated roofs. The building has some of the richest examples of shek wan in Malaysia. Shek wan is a pottery style of roof and exterior wall decoration originating from southern China. Groups of colourful terracotta figures depict subjects from mythology and history. The gable walls at the end of the main hall roof and ends of the side halls, symbolize the division between the spiritual and the temporal worlds. They are built in the style known as the wave pattern. At the front of the main hall at left and right are shrines to the male and female guardians of the door. At the rear of the main hall is a shrine to the three founders of the clan. Ornately carved gilded wood panels frame the ancestral shrines. On the altar table are large blue ceramic vases and two figurines representing servants of the ancestors. The Chinese veneration of ancestors places significance on funerals, which pave the way for the deceased to enter into the next life. The rites associated with funerals are geared towards ensuring that life after death is more comfortable than that on earth. Included also are wakes and funeral processions through town, incorporating music, floral wreaths and banners. In the olden days, a sedan chair was carried in front of the cortege and the spirit was supposed to ride in it. Nowadays, a photograph of the deceased represents the spirit. Two funeral shops still exist on Jalan Petaling. Shop No 143 has been in the same family for three generations. Along with coffins, other funeral accessories such as white paper lanterns, clothing for the deceased as well as the mourners are sold. The children of the departed, if Taoists, mainly wear black or sackcloth while the grandchildren wear blue. On this street and around the corner on Jalan Sultan, are two shops that sell Chinese ritual objects and funerary items such as candles, joss sticks, censers and paper offerings. The latter include elaborate paper models of mansions, cars and servants. Every effort is made to keep up with the times and accessories such as mobile phones, credit cards, sneakers are also recreated. The Taoists believe that heaven is a mirror of earth. These amenities are burned as offerings during the funeral to ease the journey of the soul into its next life. Chik Seng Tong, at Jalan Sultan, was founded by Kapitan Cina Yap Kwan Seng as a funeral parlour, mainly for the dying destitute. It also served as a morgue. This parlour is now defunct. The Colonial Hotel at No 39-45 Jalan Sultan was very popular with non-Europeans in the 1930s. Sited for its close proximity to the Sultan Street Railway Station, the Hotel was listed in the Malaya Directory, 1959 as a first class boarding house. Well-known singers were brought in from Hong Kong to entertain. The Hotel was owned by Tong Ah and Company. The building consists of four shophouses with an impressive triangular pediment over the middle two with decorative finials located at both ends. This building, along with others in the block, was recently damaged by fire and is in a bad state of repair. The associations that were formed to assist the Chinese migrants can be based upon groupings of clans, trades, cultural and social activities. An example of a cultural association is the Yan Keng Benevolent Dramatic Association. Founded in 1920, it is one of the oldest Chinese opera clubs in Kuala Lumpur. It raises money for charity by performances of Chinese opera and choral singing. The money is mainly donated to the old folks' homes, hospitals and schools. As membership decreased, part of the premises is now sublet for extra revenue. The tall parapet wall, facing Jalan Hang Jebat, with the name of the Association on it, replaces the original balustrades typical of the period. Beautiful classical arches line the five-foot way. Located at 78 Jalan Sultan, this three-storey building is owned and occupied by the Grocers' Guild, a trade association representing the interests of the Cantonese-speaking grocers, retail traders and sundry-shop owners in Selangor and Kuala Lumpur. Supermarkets and convenience stores are replacing the retail shops; hence the role of the Guild is being eroded. Sadly, its membership has dwindled to only 73 members and sections of the building are now sublet.According to its trust deed, the building will be given to the government when the Guild is no longer in existence. This Neo-classical building has fine lines with balconies on the upper floors. The upper balcony is deeply recessed with an unusual shading device above. The facade of the building is surmounted by a curved baroque pediment with "stone" scrolls and medallion. Observe the two giant order pilasters, which are embellished with decorative capitals and "stone" buntings. Jalan Hang Lekir is part of the bustling Chinatown street markets where bargain hunters can find items of every description and quality. Further along are the flower sellers where cut flowers, wreaths and plants can be purchased. Leading from Jalan Hang Lekir is the Penjaja Gallery gateway to the wet market, known variously as the Drury Lane, Madras Lane or Petaling Street Market. Catering to Kuala Lumpur shoppers since 1914, some of the stalls have been run by the same family for three generations or more. At the rear of the Market is an open parking lot where the Chinese wayang theatres, and later the Madras Cinema, used to be located. Absorb the sights and smells of the Market as you walk towards the exit on Jalan Petaling. This street was part of the red light district, with as many as 39 registered brothels in 1890. Today, part of the road is a hive of activity with shops and hawker stalls selling everything from souvenirs to the latest electronics. Come evening, this part of Petaling Street is closed to traffic and the area is transformed into a lively night market. The Kuala Lumpur Heritage Trails is collaboration between Tourism Malaysia and Badan Warisan Malaysia (Heritage of Malaysia Trust). The Badan is a non-profit non-government organization. It was established in 1983 with the objective of promoting the preservation and conservation of Malaysia's built heritage. No.2 Jalan Stonor, 50450 Kuala Lumpur. Perak was once a wealthy Malaysian state, rich not just with the valuable tin deposits that became the backbone of Malaysian economy at one time, but also with its cultural and traditional heritage. These days, modern-day Perak is known for its bustling cities, beautifully landscaped parks, imposing limestone hills, and its many fruit stalls that line the street selling the famous Tambun pomelos and groundnuts. 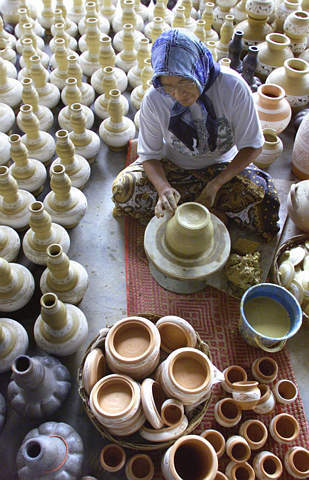 Not far from Perak’s royal town of Kuala Kangsar, in the district of Sayong, is the center of a unique cottage industry specializing in the production of earthenware jugs, the labu sayong, another of Perak’s famous contribution to Malaysia’s traditional craft heritage. The labu sayong is an elegant, gourd-shaped carafe that is used to keep water cool. The jug, with the characteristic double bulb design, is burnt to a black colour that gives it the ability to cool its content quickly. It is even believed that the drinking water stored in the labu sayong has certain health properties to cure common ailments like cough and fever. The labu sayong displays some fine designs inspired by Malaysian tradition and culture. Such motifs that can be found as ornamentation on the labu sayong are designs based on local flowers (bunga tanjung, bunga pecah empat), spices (clove, star anise) and leaves (bamboo shoots). The beautiful workmanship present in each labu sayong can be attributed to the fine skill of the craftsmen as well as the high quality of clay used in the process. Very fine clay soil, found along the riverbanks, is used in this craft, which is then pounded into extremely fine powdery form. The coarser remains are removed before water is added. The mixture is then carefully kneaded to dispel air bubbles and shaped into its distinguishing bulbous form, which consists of a body, a neck, a head and a spout. Once completed, the labu sayong is then left to dry in the sun, after which it undergoes three levels of heat before it is ready for use. First, it is smoked with coconut husks and some firewood, then it is fired in a kiln at high temperatures and finally, fired with rice husks to obtain the colour of rich ebony. The labu sayong is then glazed on its bottom with resin to prevent stored water from seeping out, rendering it waterproof. These days, the labu sayong can be found in many kitchens as the preferred storage for drinking water, as well as in the main areas of the home as decorative pieces. 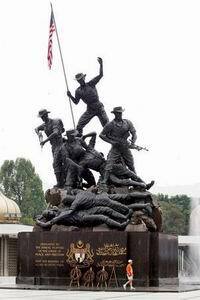 Mention Tugu Negara (National Monument) and the picture of some huge tall bronze figures of soldiers standing and supporting their fallen comrades would come to mind. Almost all Malaysians have been to the Tugu Negara complex in Taman Tasik Perdana in Kuala Lumpur at least once in their lifetime.Not many know that the first Tugu was not the one in the form of human figures but was a tall concrete column found within the present complex.On the column was a clear record of dates of great human tragedy: First World War (1914-1918), Second World War (1939-1945) and the Emergency (1948-1960). Its original location was Jalan Tugu near the roundabout in front of the Kuala Lumpur railway station and opposite Masjid Negara.Most "KLites", if asked, will not remember Jalan Tugu although they may pass by the roundabout often. This is where the first Tugu was set up by the British Administration to commemorate the wars and honour the fallen heroes. Its base is still there, a 10-square-metre flat grass-covered ground. Obviously, it does not attract anyone’s attention. When the present site was chosen for Tugu Negara, the column was moved there with a permanent base surrounded by a moat. On it are the names of fallen heroes.The present Tugu Negara complex in the Lake Gardens area was opened on Feb 8, 1966. It incorporated a Memorial Park as a symbol of the country’s gratitude to the fallen heroes. The RM1.5 million (human figures) monument within the complex is dedicated to the 11,000 people who died during the 12-year Emergency (1948-1960). The monument was the work of sculptor Felix de Weldon, who also did Washington’s Iwo Jima Monument. The Tugu Negara is considered the largest bronze monument grouping in the world. It went through extensive renovation in 1975 after it was damaged in an explosion set off by suspected communist terrorists.A sturdy fence was erected and the complex was declared a protected area between sunset and dawn. Over the years, the place has somewhat lost its glory. The Jalur Gemilang is now raised at dusk and lowered at dawn, without elaborate ceremony, by a soldier. This contrasts with the scene about a decade ago when there would be a ceremony conducted by a squad of soldiers, officers and men in "Number One Dress" (ceremonial uniform) steeped in military tradition. The raising and lowering of the flag was accompanied by the "Last Post" on the bugle blown by a soldier. On July 31 every year, when the country celebrates Warriors Day, the Tugu would be the focus as the King, the Prime Minister and heads of military and police lay wreaths in remembrance of the fallen heroes. The Malaysian Chinese population were the immigrants from the southern provinces of China. They were divided into several different clans including the Hakkas, Foochows, Hainanese, Teochius and Cantonese. during the British period in the early 19th Century, the Chinese, who had come to the Malay Peninsula via Penang, Malacca and Singapore, were employed on tin mines and rubber estates. Some of them were hired in trade, as craftsmen and skilled mechanics, others worked in sundry shops as shopkeepers. Due to the discovery of tin fields between 1850 and 1870 in some parts of Perak and Selangor states, and the increasing demand for tin ore in tin-plate industry in Europe; the Chinese immigrants, in a large number, drifted to work in tin mines. The Chinese who were hard-working labourers eventually changed completely the pattern of society in the Malay Peninsula. Many new settlements and urban centres were developed, among them Taiping, Ipoh and Kuala Lumpur. The Chinese were not only settled inland permanently but had brought their customs, religion and language as well as the Southern Chinese architecture. The Southern Chinese architecture in Malaysia can be classified into residential such as the traditional shophouse and terrace house, religious such as Buddhist temple; and public such as clan or association building. The traditional Chinese shophouses and terrace houses are the two most popular residential buildings found in many urban areas in the country. A shophouse, normally has two or more storeys, is a commercial and private structure. The tenants usually use the first floor for commercial purposes such as sundry shop, light industry or warehouse, and reside in the upper floors. The building is not free standing, rather, it is connected to several other shophouses, which create a shophouse block. This shophouse is repeated to form streets and town squares.Building materials such as brick, plaster, concrete and timber are commonly found in shophouses. A typical traditional terrace house has one-storey with a street-level porch in front. Usually, this type of building has big entrance doors with timber bars locked into the door head, metal-bar and louvered-panel windows; and a few openings. The building is often designed in a symmetrical organisation in which the entrance door is located in the middle with windows on both sides. Depending on the tenant's wealth, the terrace house sometimes has glazed tiles at the base of the front walls. Like the shophouse, the terrace house uses brick, plaster, concrete and timber as major materials. Although there are a great number of Chinese embracing Christianity and Islam, the majority are still Buddhists. Like the mosques, the Buddhist temples can be found in villages as well as in small towns and cities. These temples possess significant characteristics which contribute to the Southern Chinese architecture. A typical Buddhist temple will have overhanging eaves made of clay tiles jointed by mortar, ornamented figures of people, angels, flowers or animals located on roof ridges; a big entrance door in the middle, windows of simple geometrical shape; and colourful mosaic tiles. By and large, the styles of the Southern Chinese architecture in Malaysia have been influenced by three major factors which are history, climate and religious beliefs. The historical factors play an important role in the Southern Chinese architecture. Many traditional buildings including shophouses and association buildings have adpated the local and colonial architecture into their building facades. Some have arches and classical columns to support the building structures. Large openings are provided for ventilation purposes. A second factor that has influenced the styles is the climate. Most buildings have large openings, louvered doors and covered walkways. These elements were designed in response to the warm and humid climate of Malaysia. The use of jack-roof and air-wells, which can be seen in many old shophouses and terrace houses,are a few examples of building elements that repond to the local climatic conditions. Finally, the beliefs among the Chinese in supernatural spirits have been a primary concern in erecting any building. The concept of "Feng Shui", which literally means wind-water, is a geomantic system by which orientation of sites are determined in persuant of harmonic relationships with the cosmic forces. Ornamental symbolism plays an important part in the convevance of meaning in placement. The use of bright colours such as red, orange and yellow has become a characteristic of the Chinese buildings in which these colours represent an ethnic rite. The emphasis of ornamentation on the temple and association buildings is considered important among Chinese believers.